I first heard of Potted Potter: The Unofficial Harry Potter Experience sometime in the late summer of 2012. The show’s premise is performing all seven Harry Potter books in seventy minutes with only two cast members. Was this even a possibility, or was I recalling the amount of page numbers and characters incorrectly when I reflected that there were over 300 characters and 3407 pages? When the performance came to my attention, I was currently re-reading the books, and I thought it to be too obscure of a coincidence to not go out and see the show. The entire premise of the project alone seems too other-worldly to even embark on, and the shock value of that tagline is not to be overlooked—for it is the selling point. The very prospect of all seven Harry Potter books being contained within a seventy minute parameter is un-thinkable for a fan, and so the idea sells. I was definitely sold. I eventually made plans to go and see it this past December 2012. In the month leading up to going to the show, I built up more anticipation than I needed to and propelled my hopes beyond any level that could ever be lived up to. It is also important to note that my high expectations were due to the intense amount of sentiment which all of the Harry Potter books bear to me, as they do with so many others. Finally, the night of the show came: the curtains were figuratively drawn at the Water Tower Place Theatre, and the performance began. From start to finish, it was nothing but a disappointment. Instead of trying to create any sort of impressive, or admirable, or even humorous production, the pair of Jeff and Dan decided to keep their show anchored to a street-performance quality (at which the show started in the mid-2000’s and never progressed). The premise of the show is that there are two actors who are there to put on a very expensive, lovely, and fully realized parody of all seven Harry Potter books to the audience, and one of the two jokes which is returned to every-minute of the show is that this is not the case—they do not deliver an expensive, fully developed parody. Jeff is supposedly the world’s foremost Harry Potter scholar, and in addition to playing Harry for most of the sequences –where they are, in fact, trying to act out the books, and not returning to the same joke which relies on the audience’s, as well as their own recognition that, “wow, they (we) aren’t doing that”– his role throughout the entire show is to express the opinion on behalf of the half of the audience who has in fact read the Harry Potter books. Jeff’s role is lost to the second joke, which is that Dan hasn’t read the books and whose role represents the other non-read half of the audience. 1) Jeff attempts to describe an aspect, or a scene of the Harry Potter series, and then he describes the set, prop, or knowledge of the series that the two of them will need to have to properly perform the scene. 2) Before Jeff can finish his description, Dan interrupts and says the situation is under-control. 3) After some uncomfortable conversation, it is revealed that Dan does not know what to do, which set materials/props to have acquired, how to spend their budget, or very much about Harry Potter at all. 4) At this point Jeff, as well as the audience are face-to-palm in recognition. 5) Once the actors and audience have recognized once again that there is no budget to spend and Dan hasn’t read the books, it is then concluded that they cannot put on the promised production, and they then move on to attempt whatever lesser-means of a performance they could muster. Though, for all of its blunders, the actors must at least be commended of their energy. For the entire duration of the show, the two actors lobby for audience reaction and interaction, eventually culminating —in the only really entertaining bit of the event— in a game of Quidditch. In this game, the front-row audience, which is divided into two subsections (Slytherin vs. Gryphyndor) knocks a beach ball back and forth towards two illuminated neon-rings posted high above the stadium. At the end of the match, Jeff comes out dressed up as a golden snitch, and is slammed into the ground by one of two children called up to the stage to be seekers. Leading up to this theatrical marvel, Dan continuously runs onto the stage yelling, “Quidditch!” This moment was the only other funny part of the show–which peculiarly also had to do with Quidditch (conclusion: Quidditch is the funniest aspect of Harry Potter). Unfortunately though, this joke too falls victim to bilateral-joke-cycle which was constructed: they return to this yelling of Quidditch continuously because Dan does not know the meaning of Quidditch. Thus, Dan is unable to participate in the athletic competition because he has a vaccum and no broom–even the seemingly hilarious portion of the show was not very funny at all. Before the show began, one of the two creator-cast members, Dan, ran up and down the aisles, shaking everyone’s hand, and introducing himself. I could have sworn there was a tearful glint in his eyes: perhaps this action was an apology of what was to come. Note: “Potted Potter” is currently on its U.S. tour; the production has no upcoming performances in Chicago, but can be found in more cities throughout the country. 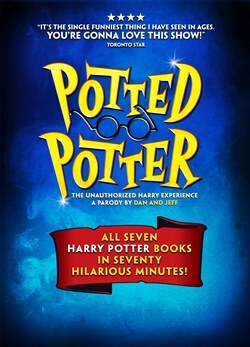 Go to http://www.pottedpotter.com/ for more information on current shows and upcoming tour dates. 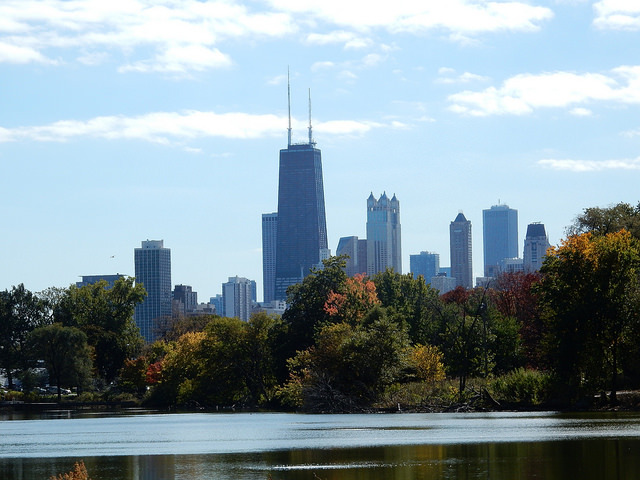 My name is Russell Nye, and I am from Naperville, IL. This is my first year at DePaul. Prospectively, I am an English major, although I’m considering doubling in Philosophy. Reading the writing of other people and trying my own hand at it have been the preferred methods of entertainment of mine for a fairly long time. Personally, I find writing to be very therapeutic; Nothing clears my head more than writing for no other reason than to write.